Broilers are the perfect piece of kitchen equipment for preparing juicy steaks, smoke-flavored burgers, and all sorts of meat products. These are heavy-duty units that can accommodate extremely high temperatures starting at 550° F and up. Because of this, broilers can provide tremendous amounts of heat for cooking mouthwatering meat dishes. Although they aren’t the most versatile in the kitchen, broilers are the best at what they do. Steakhouses, grill restaurants, and foodservice establishments that pride themselves in serving wonderful steaks, burgers, and meats will find that a high-quality broiler is a worthy investment. Here, we’re going to lay out everything you need to keep in mind to help you choose the best broiler for your specific needs, including the different types of broilers, what features you should look for, and some tips to help you find a broiler that’s right for you. There are several styles of broilers available on the market today. However, each style uses the same basic technique of quick, efficient cooking using intense heat. Some broilers can also be used to reheat certain foods. Other types, such as salamanders and cheesemelters are used for lighter applications. Also called deck-type broilers, upright broilers are designed to conserve floor space while producing high volumes of food quickly. Establishments that serve plenty of steaks or burgers by the hour will do well to invest in a heavy-duty upright broiler that can take a beating during the busiest days of the week. Upright broilers are also perfect for banquet halls, hotel ballrooms, and large-scale foodservice operations. Upright broilers have large broiling areas. Some models even have multiple decks or cabinets to cook several items at once. Some broilers can also be stacked on top of each other to save space while doubling or tripling your kitchens broiling capacity. Upright broiler work by using heating elements placed above the broiling area to produce intense heat. The heat that comes from above is especially helpful in removing grease from the surface of meats. The grease is then drained off using removable grease pans placed below the broiling grid. Salamanders use a concentrated blast of low to medium heat coming from above to finish food items within their narrow cavity. Although some models can be used for full roasting, salamanders are designed to work in addition to high-powered cooking units. They are best used for giving meat products a crisp finish, browning casseroles, or caramelizing sugars. Premium models come with up to six burners, allowing you to control the heat settings for different sections of the broiling area and cook a variety of food products. Some are designed to retain heat while others can be fired up on demand for some quick, last-minute use. Unlike upright broilers, however, salamanders are quite small. Most models are half the size of a commercial convection oven. They often don’t go larger than 48” in width. Because of their size, they are perfect for mounting on a wall or on a top shelf above the restaurant range. Some salamander models can also be stacked in twos or threes, which is great for commercial kitchens anticipating a lot of growth in the future. Cheesemelters are specifically designed to melt cheeses on top of dishes, such as subs, french fries, and pasta. They can also be used to toast breads or finish desserts. Cheesemelters use direct, radiant heat that is blasted from above the cooling racks. Unlike convection ovens, which circulate heated air throughout the baking chamber, cheesemelters focus heat from the top down, much like how the sun heats everything from above. This way, only the top layers will cook and crisp, leaving the sides unfinished if you haven’t fully cooked the dish. Cheesemelters typically have adjustable racks so you can choose your heat intensities. Delicate items can be positioned further from the heat source while robust foods can be adjusted closer. Many models have several burners and/or heating elements so you can finish multiple types of food at the same time. Some models also include removable separators that allow you to create sections within the main cooking chamber to provide more control over the finishing process. Cheesemelters are usually cabinet-style units. They don’t look very different from standard toasters with the clear, hinged door that opens downward. Some cheesemelters have a conveyor belt, where you can place items at one end so that the belt pulls them under the heating elements and dispenses the finished items at the other end. This type of cheesemelter is perfect for sandwich shops and assembly-line kitchens. Other cheesemelters have an open-front deck where items can be slid in or out on a stainless steel or chrome-plated rack. Horizontal broilers are specifically designed to cook whole chickens in large numbers. These usually come with a built-in rotisserie where whole chickens are skewered on a spit while cooked over the heating elements. Some horizontal broilers have grate tops instead of a rotisserie. The grates of a horizontal broiler come with round rods to prevent the chicken from sticking. Vertical broilers slowly roast meat suspended vertically on a spit in front of an infrared or coil burner. Infrared burners use ceramic elements that radiate heat to the cavity, while coil burners have a single coil that snakes through the unit to ensure even cooking from top to bottom. Vertical broilers are sometimes called gyro broilers because they’re often used by foodservice establishments that serve gyros and shawarma. They can go anywhere from 20 to 42 inches in height. Although vertical broilers aren’t as versatile as other types of broilers, they can make for an attractive display in an open kitchen. Street vendors and food trucks like to use vertical broilers because the aroma of roasting meats attracts customers from down the block. Charbroilers are the indoor version of the outdoor grill. Unlike top-down broilers and salamanders, charbroilers use grates that are placed above a heat source. The high temperatures heat up the metal grates, usually cast iron or steel, which create appetizing branding marks on food. Like other types of broilers, charbroilers are made for quick-cooking meats. They are not designed for slow-roasting whole chickens or turkeys because they don’t have a cover that will lock in the meat’s juices while it is cooking slowly. Charbroilers can be mounted on a counter, a worktable, an equipment base, or a refrigerated chef table. Freestanding floor models are also available for larger kitchens. Typically, floor models have a cabinet-style base for extra storage to make up for their larger footprints. Some charbroilers are designed specifically to be used outdoors. These are also typically mobile units that come with a bevy of accessories, such as a rotisserie, a dome lid, and side burners for sauces and side dishes. Outdoor charbroilers are built to withstand the elements. They’re perfect for patio grilling, catering, country clubs, and resorts. Different brands use different heating elements for their broilers. Many models use radiant heaters, but electric models are also available. New technologies have also led to the rise of infrared broilers, while foodservice establishments with a taste for tradition have access to wood-fired or lava rock broilers. Each of these have their own advantages and disadvantages. Let’s look at them one by one. Radiant heaters are pieces of cast iron or stainless steel that extend from the front of the broiler to the back. Gas flows down the length of these heaters, which is then lit up by a pilot to distribute the heat throughout the entire broiling area. In most models, radiant heaters are placed every 12” to ensure uniform heat distribution. Some premium models have radiant heaters at every 6” to further minimize the chance of uneven cooking. Electric heaters work like radiant heaters. However, instead of gas, an electric current flows through them. The heaters turn red-hot and the electricity is converted into heat. Electric broilers often come with pans at the bottom of the broiling grid. These can be used to contain water for a water bath that helps reduce grease fires. Grease that drips into the water can also create more interesting smoky flavors. These water or grease pans should be cleaned every day to avoid negatively affecting the flavor of the food product. Infrared heaters use high-intensity radiant energy – which should not be confused with radiant heating elements – that heats the food directly. This a fairly new technology that is usually seen in premium broilers. Infrared broilers are available in gas and electric variants. Electric units use high-temperature heating elements as a heat source, while gas infrared broilers often have ceramic plates. These plates have holes on their surface, and air and gas pass through these holes at an extremely high temperature of 1,600° F. The ceramic plates then distribute the intense heat to the food with much more efficiency than radiant or electric broilers. This allows infrared broilers to cook the food faster. It also uses less gas and retains more of the meat’s savory juices. Some of the more expensive models can cook food on both sides simultaneously. This further reduces cooking time and boosts kitchen productivity. Some professional chefs prefer broilers that are heated by lava rock. Lava rock is a porous stone that can absorb high temperatures and distribute heat around the broiling area. Lava rock broilers do not provide as much heat as other types of broilers, but they create a distinct flavor that is rendered when fat from the meat falls on the lava rocks. However, lava rock broilers are the most tedious to maintain. The rocks should be changed at least every six months or less. Rocks covered in old grease drippings could negatively impact the taste of your food products. They are also more difficult to clean than other broilers. Wood-fired broilers can generate more heat than radiant, electric, or lava rock broilers. They can also make a show-stopping centerpiece in an open kitchen. Some chefs like using wood-fired broilers because the smoke coming from the wood imparts a unique smoky flavor to their products. It goes without saying that commercial kitchens using wood-fired broilers need access to a constant supply of wood for fuel. Staff should also be ready for the frequent cleaning that is required when using a wood-fired broiler. Most broiling grates are made from cast iron, which is extremely heavy-duty. Cast iron also retains high temperatures well, making it perfect if you need to use the broiler all throughout the day. However, cast iron isn’t corrosion-resistant. An alternative is to use stainless steel instead. Steel grates are also lighter and easier to clean than cast iron. Some stainless steel grates have a chrome plating that prevents food from getting stuck and makes them even easier to clean. However, steel grates, chrome-plated or not, are not as effective as cast iron when it comes to retaining heat. Many broilers have height-adjustable grates. This gives you more room for flexibility because you can choose how near or far the food is to the heating elements. Most grates can also be pulled out for easy cleaning. If you’re cooking a lot of fish and seafood, look for a broiler with grates that have thicker rods to support delicate meats. These so-called seafood grates often have rods with raised edges so you can still give your fish fillets those tantalizing grill marks without overcooking them. Some grates also have floating rods that rotate within the frame. This allows them to expand freely without developing weak points. Floating rods are also easier to clean than stationary rods. Most top-heated broilers come with removable grease pans that collect grease drippings. The heat that comes from the top of the broiler melts fat off the surface of the meat, and the fat drips away as grease. The grease pan helps to prevent grease from collecting at the bottom of the broiler and makes the unit easier to clean. If your broiler is positioned against a wall or other equipment, having splash guards for the rear and sides will protect other items from splattering grease. Splash guards also make cleanup easier. Broilers produce a lot of grease and smoke, which can be detrimental to kitchen safety if not addressed properly. Make sure you install the right hood and ventilation system and comply with all local permits before getting a broiler for your kitchen. Commercial hood systems filter the air and remove contaminants such as grease, smoke, carbon monoxide, and other harmful particles suspended in the air. They also remove heat and encourage fresh airflow to create a safe, comfortable working environment. This helps improve the overall energy efficiency of your kitchen and reduce HVAC costs. 2. Choose between gas or electricity. Many foodservice operators prefer to use gas broilers because they heat up faster and more effectively than electric units. Gas also provides them with more flexibility to adjust their cooking settings. However, gas can be expensive in some areas. Gas broilers can also be bulky and require extensive clearances, making them difficult to use when space is a limited resource. The alternative is to use electric broilers, which can be easily moved anywhere with an outlet. Electric units are not the best for high-volume production, though, so keep that in mind if you need to cook plenty of steaks every hour. 3. Look at how much space you have. Most broilers have widths that come in increments of 12 inches, with the smallest units typically measuring 24” while higher-end models going as wide as 72”. Your size considerations should include how much space you have in your kitchen and how many food items you need to prepare at the same time. Obviously, larger facilities that need to prepare more food products at a time will do better with larger broilers. Also, don’t forget to pay attention to clearance requirements. Because broilers produce a lot of heat, they must be placed at least 6” away from walls and other cooking equipment. 4. Consider your mounting options. Most broilers have a standard counter depth, which means they typically run 24” to 30” deep. This allows them to be mounted on most kitchen counters or equipment stands that can accommodate their width. Upright broilers, on the other hand, usually have a set of lockable caster wheels that allow them to be moved in and out of their place. Many manufacturers also provide refrigerated bases for mounting their broilers, which is a convenient option for foodservice operators who prefer to keep their food items close to the cooking area. 5. Look at the BTU rating. The amount of heat a burner can produce is measured in British thermal units (BTUs). A broiler with a higher BTU can generate more heat over a length of time, which means it can cook food faster than a lower-BTU broiler. Most standard-duty broilers typically have a BTU of 30,000. Heavy-duty units, on the other hand, can generate at least 40,000 BTU of heat. When you’re shopping for broilers, compare the BTU ratings of each unit and get one that can keep up with your kitchen’s demands. 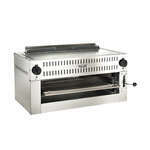 Check out CKitchen's full selection of broilers, salamanders, and cheesemelters.